Make It Davao: MRT in Davao City? A Mass Railway Transit in Davao? 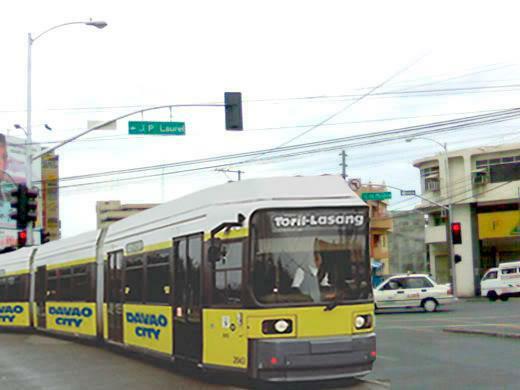 This wonderfully photoshopped image of a Mass Railway Transit (MRT) along the corners of J. P. Laurel and Claro M. Recto Avenues is not mine, nor do I lay claim over it as I have just picked this up about a year ago while browsing through the forum of Skyscrapercity.com - Davao City and Samal Island thread and, with much regret, could no longer locate the particular page where I lifted the photo to give due credit to its creative owner. Since I re-posted the photo to my Facebook Fan Page a second time in April 10, 2013 (the first on September 20, 2012), it immediately went viral over the Internet and in four days overwhelmingly drew the attention and interest of some 37,280 people, with 1,249 "Likes", 203 comments, and 226 "Shares" and as of this writing, the number is still incredibly growing. . . But do we really need one in Davao City? Surely, a mass railway transit like in Manila was conceived in the minds of the Philippine government and erected solely to ease up the perennial traffic in certain portions of the metropolis particularly during the horrible rush hours of commuters coming in and out of the city but in reality did nothing really practical to serve its purpose. Instead of reducing the number of public utility vehicles such as buses and jeepneys which regularly ply along the thoroughfares where the MRTs are erected, the long and wide expanse of the structures have encroached upon a large and considerable portions of the highways and hence have only added unnecessary burden in the already heavy traffic routes thereof. I fear of a possible repeat of the disastrous mistake of Manila in Davao. Comparatively, traffic in Davao is nothing to, and is much milder than in Manila or in Cebu. In my opinion, the MRT should be a conveyance of ease to visitors to the city from nearby provinces in Mindanao than to commuters within the city itself. Now, the city government of Davao is considering its own metropolitan rail system by 2015 in anticipation of the city's ever increasing population, and to cope with its unabated economic growth, and the attendant pressures of urban development. According to a study conducted by Petra Konsult & Associates, Inc. for the Davao Metro Rail Transit, the rail system with 26 stations from the towns of Toril to Lasang will require $844.50-million investment before it becomes operational by 2015 and will eventually be part of the 2,000-kilometer six-phase railway project which would link the cities of Cagayan de Oro, Iligan, Zamboanga, Surigao, and General Santos, as well as Agusan province. The idea of a mass rail system in Mindanao was said to have been first brought up with former President Fidel Ramos during his visit in Davao City in 1992. Since then, investors from Germany, Austria, India, France and Thailand have expressed interest in the railway plans for Mindanao. Nevertheless, while I personally do not approve of the idea of MRTs in Davao City as this will irrevocably alter forever the simple serenity and yet cosmopolitan cityscape of Davao, I submit unconditionally to the wisdom of the architects of the city. It is good to have this kind of transportation; First, lessen the traffic if the Public Utility Jeep (PUJ) is cut off. Second, might be less air pollution due to limited PUJ running. Third, the city transportation system is more organize. But, in contrast you are right. The simple serenity of Davao City might be alter forever. More to it, is that when PUJ is cut off, more Dabawenyos suffer financially especially the jeepney operators. Pros and cons is important before deciding. Traffic is not the only reason why we need MRT. it will strengthen the economy of mindanao because it is more faster and cheaper to travel in rail way than riding a bus. a four hour travel from Davao to gensan will lessen to 50 - 60% of time.